Understated, classic and precious, the Grande Heure GMT is a tribute to travel. This unusual timepiece, ideally suited to long-distance voyagers and modern-day aesthetes, shows the hour in two time zones at a glance. 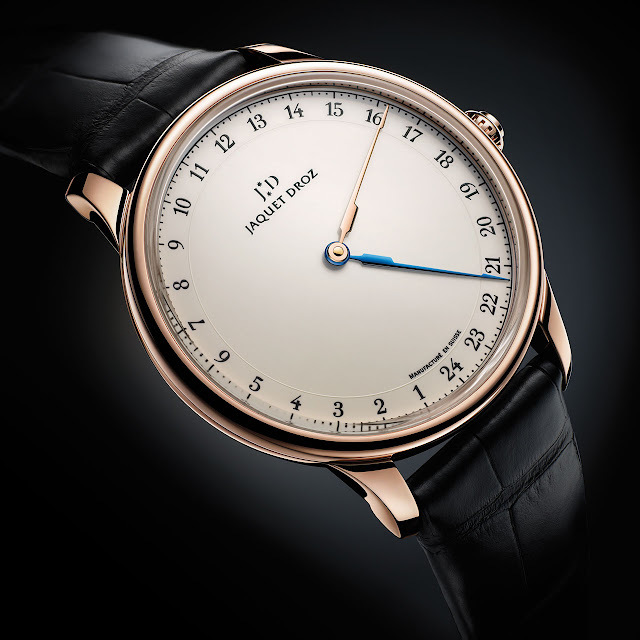 The 24 Arabic numerals that circle the Grand Feu enamel dial trace each moment of the day in two separate locations. Never before has a watch shown two time zones with such clarity and ease. This innovative display is enhanced by the two hands in a compass-like formation. The red gold hand shows local time whereas the blued steel hand gives time in the wearer's country of choice. By opting for the unconventional system of a single crown to adjust both hands, Jaquet Droz has succeeded in making the Grande Heure GMT simplicity itself.